The Rexel Mercury RDS2250 is a strip-cut model which shreds paper into 5.88mm wide strips, giving it a P-2 security rating (suitable for everyday rather than confidential shredding). 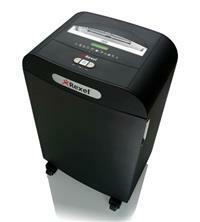 Made for an office environment with up to 20 users, this shredder also has a number of handy features including: Mercury Anti-Jam technology which means it will only attempt to shred stacks of paper within its sheet capacity limit (thereby avoiding jams associated with over-feeding); a safety measure whereby the shredder will stop if the door is opened during shredding; automatically lubricating cutters; a separate CD tray to collect CD shards; an induction motor for quiet running; a bin full alert; and a reverse function. In addition to paper, this unit will shred credit cards and CDs and it features a 50 litre bin which can hold up to 400 shredded sheets of paper.